The first cemetery was on the hill a half mile south of Columbia. Knut Wiggins had given the land for it. He owned what has since been known as the Babcock Hill. There were eight or nine graces but only one with a marker. I recall six who were buried there. Blanche Grimes, Mrs. Eggiman, Frank Haenel, Susan Haenel, Mr. Nemitz and the first Mrs. Immorstag. A number of Columbia folks were buried in the Pine Valley cemetery. 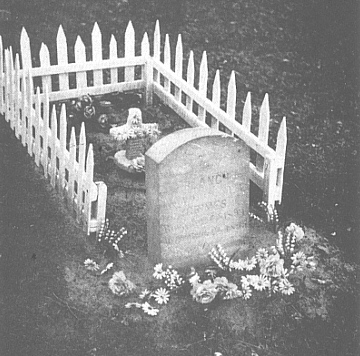 Some were buried on their own property. Later years a nice cemetery has been kept up and fenced, a mile northeast of Columbia. These graves have markers. Some preferred to be buried in the Neillsville cemetery. While the sawmill was in action there was one boarding house, a two story building was operated by Ole Frisley. Mrs. Emma Wright gave meals. Mr. Boynton, a member of the Wisconsin Farm Land Company, owned the building. When the saw mill was discontinued he gave the building to the community for a church. The boarding house which Mr. Boynton gave carried the stipulation that it be dedicated a Baptist Church. The upper story was removed and it was turned to face Main Street. Plays and socials were given to raise money to decorate and furnish the church. About 1900 it was dedicated. At that time a picture was taken of a large group of people on the steps. Fro a time various ministers came to preach. About 1901 a resident minister, the Rev. McClure, came to Columbia. He built a far home two miles south of Columbia. 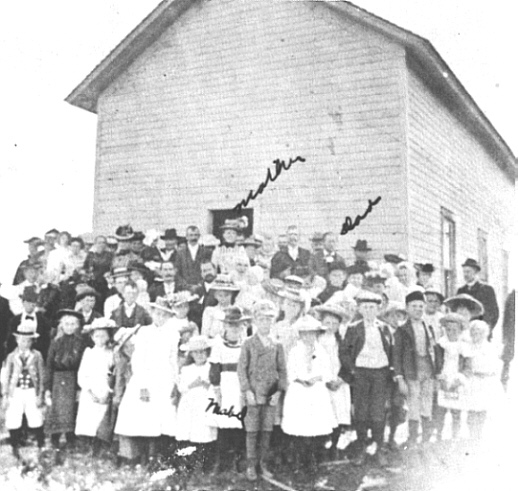 Gathering at the dedications of the Baptist Church in the early 1900’s. The Sunday School was conducted at various times by the Rev. McClure, William Helling, E. B. Starrett and Mrs. Joe Winters. The Lutherans also held services there once a month with Rev. Brandt coming from Neillsville. There services were held for a number of years after the Baptists discontinued using the building. For some years it stood vacant and was finally torn down for lumber by Jacob Schmidt of Neillsville.